What could look more beautiful next to your pristine in-ground pool than a gorgeous stone patio? Use stones of all the same color to create a modern and minimalist design or add splashes of colorful stones to add to the wow factor. Don’t forget to buy some matching outdoor furniture and a nice grill to complete your poolside hangout. Who says your natural stone landscaping can’t be as functional as it is beautiful? If you live in an area where there are a lot of hills, you may find that your lawn sees too much water runoff during the rainy season. 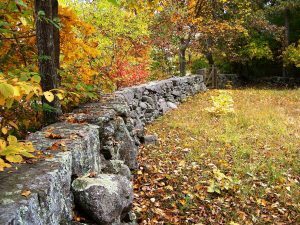 By creating a stone retaining wall where the runoff occurs, you can protect your lawn and any plants you have as well as add a gorgeous point of interest. Even if you don’t have a stone driveway, walkways from the car to the front door, around you home and to the most-loved parts of your yard will add a functional way to navigate the space while still looking gorgeous. You might even consider adding a space with an old-fashioned park bench, gazebo or koi pond for some serenity. No matter which type of natural stone landscaping you decide to enjoy, always hire a professional contracting company that specializes in stone to construct your project. This ensures it is professionally done and safe to use. Look for online reviews and ask for a portfolio or references before signing a contract. Don’t forget to verify licenses.